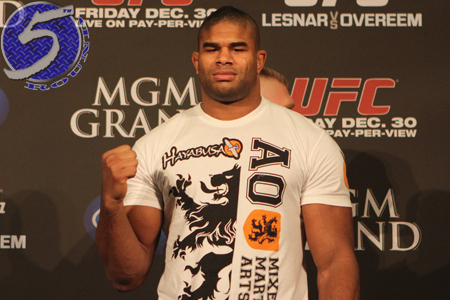 Alistair Overeem (pictured) isn’t just a standup fighter, just ask Stefan Struve. Overeem scored an early takedown and unleashed some vicious haymakers to put Struve to sleep in the opening round. Although Struve enjoyed a reach advantage, he was never able to get off due to Overeem’s unexpected takedown. What then transpired on the canvas was pure devastation. The official stoppage came at the 4:13 mark in the first period. UFC on FOX 13 took place inside US Airways Center in Phoenix, Arizona.